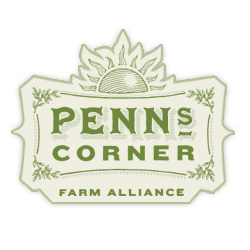 Penn's Corner is selling holiday Turkeys again this year from Schmucker Family Farm in Emlenton PA. The turkeys are free range, pastured, antibiotic and hormone free, and are fed GMO-free feed. The birds will be frozen when we pick them up, we will begin defrosting them for you so they are ready for you to use on Thanksgiving! The price is $4.46/lb, and a $25 (non refundable) deposit is required to reserve your share. All turkeys will weigh between 14 and 20 pounds, when you are placing your order please indicate if you have a size preference and we will do our best to accommodate. Click Here to make your deposit! You must have Turkey Pick Up Mt. Lebanon or Turkey Pickup Lawrenceville selected as your pickup location! 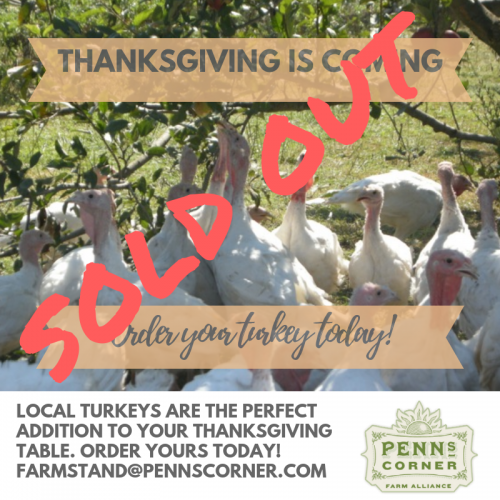 Email farmstand@pennscorner.com to reserve your Turkey and indicate your desired pick-up location (the Penn's Corner warehouse or Mt. Lebanon). The deadline to reserve your turkey is November 8th. Our Penn's Corner office location is located at 150 54th Street. Turkey pickup will be on Tuesday, November 20th between 1:00pm and 6pm. Our Mt. Lebanon location is Unitarian Universalist Church of the South Hills at 1240 Washington Rd, Pittsburgh, PA 15228 Turkey pickup will be on Monday, November 19th between 4:30pm and 6pm. Take a look at the rave reviews customers have given about their Penn's Corner Turkeys in past years! "I bought one of their [Schmucker Family Farm] 20-lb turkeys for a big Thanksgiving dinner (50+ people) at which we had three turkeys (two other people brought turkeys as well). I can't tell you how many people came up to me and wanted to know about the turkey I brought, where I got it from, how I prepared it, and most of all, why it was so good. At least 10 or 15 people said it was the best turkey they had ever had. And I now have probably the best turkey stock I've ever made. I've had naturally-raised turkeys in the past, and they've been well above average, but this was hands down the best turkey experience I've ever had. Thanks for making such a great bird!" "Just wanted to share with you that once again, there were RAVE reviews for my turkey purchased through Penn's Corner - the bird itself (I'm told) was even better than last year's- we have come to count on all the excellent products we buy through PCFA but none more than the turkey- thanks again for making this possible and special thanks to the amazing farmer that raised our bird!" Turkeys roaming the orchards at Schmucker Family Farm (one of the Clarion River Organics member farms) in Emlenton, PA.